Island Series robots give you versatility to do simple, repetitive automation jobs. Work areas range from 300 mm x 400 mm to 400 mm x 400 mm. All Island Series robots are compatible with our line of precision dispensing pump systems: Precision Auger Pumps and Volumetric PCD Pumps. Who says with going to an entry level robot you need to compromise on dispense quality! LED Encapsulation on Benchtop - video. Operation of the robot is done via a teach pendant or computer interface. All programming functions are available in both teach formats so either can be used. The teach pendant is compact and can be placed next to the system without the need for additional tabletop space. A program may be programmed on the computer, then operated by the teach pendant. Dispense pumps can be fed from either syringe or bulk reservoirs. Depending on the pump selected for the process, syringe sizes can vary from 3 cc to 55 cc. Larger cartridges, such as 20 ounces, can be mounted on the site of the robot and pressure fed to the pump. For high volume applications that require the transfer of fluid from large reservoirs, the necessary ram or pump can be interfaced with the Island Series. 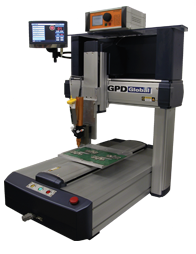 Island Series robots are available in either a stepper or servo configuration. The smallest robot, the Island 2, is available only in stepper configuration. Stepper systems need to home before each program execution to be sure that no steps have been lost from the previous program run. Servo systems are closed loop and do not need a home between program runs. Smooth motion is obtained from the servo system.